It’s been said that a way to keep the momentum going is to continually have greater goals. That’s great advice for all of us. Accomplishing goals step by step helps builds confidence and teaches us that as long as we consistently strive towards our goals, we can be successful. 2016 was fantastic for LG Commercial Displays. Ultimately we were able to help many more businesses elevate their brand image, create better customer experiences and stand out from the crowd. But it was a step-by-step process. It began with the introduction of the amazing 86-inch Ultra Stretch display at DSE. Then came the revolutionary OLED displays at InfoComm, and that turned the industry upside down. All the while our Roadshows were bringing this technology to exciting venues in areas that don’t have major digital signage shows. And that was the idea. We wanted to get as many people up close and personal with LG innovations. You gotta see it to believe it, after all. To keep the momentum going we created more whitepapers, eBooks and webinars filled with insights on making the most of our technologies. And as business grew so did our partner base, so we enhanced our LG PRO partner program to share more of our success with those that help make it happen. And finally, with all the new information our website visitors wanted mobile convenience. So we gave it to them in spades. Not just with optimization, but with a completely new mobile-ready website, rewritten and redesigned to offer more across the board. So as 2016 closes out, we’re very pleased with what the year enabled us to achieve. And we’re setting greater goals to stay onward and upward. Now the story turns to you. In 2017 we want to get to know you better, become more interactive with you and know what’s on your mind. So stay tuned, because we’ll be reaching out. All of us at LG Commercial Displays wish you a happy, healthy and rewarding 2017, brimming with Life’s Good moments. See you in January. LG’s innovative 21:9 UltraWide® monitors have been global best sellers for three years straight for a very good reason: By introducing the UltraWide technology LG empowered employees for increased efficiency and higher productivity. The monitors are part of a comprehensive suite of LG corporate display technologies that are easy to install, operate and maintain. Businesses are using LG corporate products to optimize their corporate communications process toward the audience and improve employee relations. What corporate problems do LG digital displays and desktop technologies solve? Plenty. In today’s corporate environment employees have access to all types of information on their smartphones and office PCs. But with the sheer beauty of LG digital signage employers can help eliminate distractions and engage employees with targeted content in specific areas of the building. In the case of employee workstations, LG’s desktop solutions can equip employees to do their best while helping to reduce the burdens on the IT department. What’s more, visitors can have the benefits of welcome messaging and wayfinding information at their fingertips. LG’s large format displays can be used to deliver crisp, clear and vivid onsite messaging in breathtaking UHD. Greetings, motivational content, employee awards, company news and real-time data feeds can keep employees and visitors in the know. In addition, LG’s innovative technologies such as the 86-inch Ultra Stretch signage, video walls and amazing OLED displays can set the business environment apart from the rest with a wow factor like nothing ever seen before. Wayfinding displays are perfect solutions for orienting visitors and getting them to where they need to be. 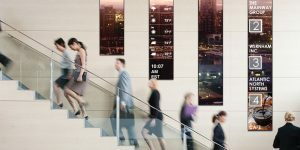 Large wayfinders can direct guests throughout the facility while small wayfinders outside of conference rooms can display meeting time and subject matter. And while the visitors are waiting, digital displays can immerse them in the corporate message and branding. In conference rooms, LG’s large format UHD displays are incredibly effective for presentations, training and video tutorials. IPS (In Plane Switching) screen technology ensures a crisp, clear view from virtually anywhere in the room, so any seat is the best seat. Like a quick-service restaurant, corporate cafeterias need to keep the lines moving so employees can relax, enjoy their lunch and get back to work on time. Take advantage of what the QSR industry knows best—LG displays excel as digital menu boards. With the IPS wide viewing angle, employees can clearly read the menu and specials while standing in line and speed through their order. Today it is common for designers, artists, security professionals and others to work with multiple monitors on their desks. Replacing multiple monitors with a single 21:9 UltraWide monitor will enable users to maximize multitasking with as many programs as they like, and numerous video feeds, on one screen at the same time. Reducing the overall number of monitors can also cut your company’s energy usage and equipment costs too. Looking to simplify workstations and slash costs? Look to LG’s Zero Clients and Chromebase™ PCs. Zero Clients can help eliminate security problems, most hardware problems and maintenance issues because they don’t have hard drives, moving parts or operating systems. A Zero Client runs on PCoIP (PC-over-IP) and connects to a cloud-based server (self-hosted or a subscription service), such as Amazon Web Services (AWS) or VMware®, to deploy desktop functions from the cloud. Chromebase PCs are all-in-one PC solutions powered by Google’s Chrome OS. They provide access to all of Google’s resources, including various applications that are compatible with and can even replace MS Excel and PowerPoint, plus hundreds of thousands of free and paid apps. Built-in virus protection, multiple layers of security and verified boot help keep the devices safe from computer threats. And Chrome OS updates itself at no cost, ensuring all devices always have the latest version. The benefits of LG digital displays in the corporate environment are well worth the investment and can bring significant ROI in terms of increased employee engagement, motivation, productivity and retention. Chromebase™ is a trademark of LG. Optical Disc Drives – R.I.P. or V.I.P.? Optical drives that can read and write CDs, DVDs, and even Blu-ray discs have just about vanished from laptop computers in order for manufacturers to reduce bulk and extra weight and create smaller, thinner and lighter machines. While it’s true today that software can be downloaded from the Internet, and most people now download and stream music and movies rather than buy it on discs, the need still remains for the discs themselves and therefore, a device to play them. But if you like to travel light and you have a new laptop or tablet, what do you do? Look to LG. LG manufactures a full line of optical disc drives (ODD) with numerous models to suit various needs. Our USB-powered ultra slim portable models are very affordable, Windows 8, 10 and Mac OS compatible, and also M-DISC™ compatible for archival storage. What’s more, LG ultra slim portable ODDs are full-function compatible with the most successful tablet on the market—the Microsoft Surface Pro. Wondering why you’d still need an ODD these days? If you have a laptop bag or tablet bag, an LG ultra slim portable ODD can easily slip inside and go anywhere you go. And once again, if you love your Microsoft Surface Pro tablet you can now make it even more versatile with full-function compatibility from LG. LG optical disc drives are still burning bright. Have a look at our full line of external and internal models from DVD to Blu-ray here. INDUSTRY PERSPECTIVES: When “New” Really Means “New to Us”. Companies improve their results through innovating. Innovation is synonymous with advancement and in our world where enabling tools and solutions present constant opportunities, the challenges of selection is ever increasing. “New” most often means “new to us.” This brings a key dimension of evaluation because “new to us” can mean that competitors for share of wallet, time and attention are already benefiting from the new approach. Leadership in our world is more often defined as being a fast follower or part of the early majority of users. The abilities to manage risk and for change management are some key ingredients of innovating. Mark Ryski, Founder, CEO and Author, Headcount Corporation noted in a RetailWire comment “When it comes to innovation, retailers in particular need to focus on the critical few versus the trivial many of business challenges”. He notes “there are so many solutions available that determining which solutions to evaluate let alone implement is a problem. Retail executives need to be clear about their business objectives, set priorities and then narrow their focus to explore the solutions that can help them achieve these”. Many innovations contribute to the accomplishment of a range of business priorities. Email and electronic commerce are good examples of broadly applicable enabling infrastructure, and umbrella approaches such as omni-channel marketing, customer relationship management and partnership strategy provide the context to assess the applicability of innovations. Innovation only happens when somebody is expected to do it. Otherwise the force of inaction will prevail. Everybody in the enterprise must expect it from everyone above and below as a culture of innovation. Patricia Vekich Waldron, Global Marketing Director, Retail, Consumer Products, IBM Corp cautions against trying to be incrementally better than the business next door, because consumers are measuring everyone against their last great experience regardless of what it was”. Innovation in the “new to us” world can mean applying approaches that are proving successful in different applications. For example, quick serve restaurant drive-thru offers lessons to banking and parcel pick up. Museum, gallery and stadium media presentation offer lessons to malls and retailers. Corporate lobby display can take lessons from transportation messaging and trading floors. 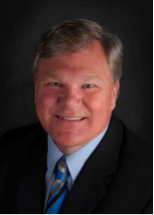 Lee Kent, Principal, Your Retail Authority, LLC advises that “The first step to saying yes to innovation is to be innovation-ready by creating an infrastructure based on a core. A core is established by looking at mission-critical processes focused around customers, suppliers and employees”. When this is slow to emerge, innovation centers should be established to be a force for improvement by identifying and advancing business, marketing, operating and technical opportunities that others may overlook or that span organizational boundaries. Dynamic in-store signage is an example of an approach that improves the productivity of place, processes and people and positively impacts many areas such as customer engagement, location appeal, branding, merchandising, supplier support, associate training, safety improvement, hiring, loss prevention and others. Introducing this approach requires executive or innovation group stewardship. Digital signage and place-based dynamic screenmedia meet the definition of “new to us” innovation definition and criteria of many organization. It’s technology has been well-proven across and within business sectors even as the content that it is used to present is specific to the goals of the individual business. It’s customer engagement and business development value through branding and merchandising support traffic generation and revenue achievement, as does it’s bringing vitality and improved ambiance in locations where it is used. For some organizations, the challenge of advancement lies in more fully using the innovations that they discover. The processes used for test, trial and discovery can differ from the budgeting and operational approaches that would allow an innovation to be more widely applies. Being innovative therefore entails defining approaches that are new to the organization, but also, advancing the ways that allow the benefits of these to be more fully realized. Francis Ford Coppola says LG OLED screens are a miracle. That’s an amazing unsolicited compliment coming from an amazing Hollywood director. We absolutely love that LG OLED technology is being so highly acclaimed. Mr. Coppola, we appreciate your continued support. Mr. Coppola has been a strong supporter of LG OLED technology this year. Watch this video from April where he hails LG OLED TV as the next frontier in cinematic home entertainment. Now imagine what LG OLED displays could do for your business’s image.